3" x 6" Folded to 3" x 3"
4" x 6" Folded to 3" x 4"
4" x 8" Folded to 4" x 4"
4.75" x 7" Folded to 3.5" x 4.75"
5" x 10" Folded to 5" x 5"
5.5" x 8" Folded to 4" x 5.5"
5.5" x 8.5" Folded to 4.25" x 5.5"
6" x 8" Folded to 4" x 6"
6" x 8.5" Folded to 4.25" x 6"
6" x 10" Folded to 6" x 6"
6.25" x 9" Folded to 4.5" x 6.25"
7" x 10" Folded to 5" x 7"
8.5" x 11" Folded to 5.5" x 8.5"
* For 14 pt. Gloss Cover, High Gloss UV Coating will be applied to the color sides, unless High Gloss UV Coating Front Only is selected. High Gloss UV Coating will not be applied to the back if you select Blank Back. 4" x 6" Pre-Scored to Fold to 3" x 4" (V&H) Our A1 Envelope(3.625" x 5.125") or an Envelope no smaller than 3.125" x 4.125"
4.75" x 7" Pre-Scored to Fold to 3.5" x 4.75" (V&H) Our A1 Envelope(3.625" x 5.125") or an Envelope no smaller than 3.625" x 4.875"
5.5" x 8" Pre-Scored to Fold to 4" x 5.5" (V&H) Our A2 Envelope(4.375" x 5.75") or an Envelope no smaller than 4.125" x 5.625"
6" x 8" Pre-Scored to Fold to 4" x 6" (V&H) Our A4 Envelope(4.25" x 6.25") or an Envelope no smaller than 4.125" x 6.125"
6" x 8.5" Pre-Scored to Fold to 4.25" x 6" (V&H) Our A6 Envelope(4.75" x 6.5") or an Envelope no smaller than 4.375" x 6.125"
6.25" x 9" Pre-Scored to Fold to 4.5" x 6.25" (V&H) Our A6 Envelope(4.75" x 6.5") or an Envelope no smaller than 4.625" x 6.375"
7" x 10" Pre-Scored to Fold to 5" x 7" (V&H) Our A7 Envelope(5.25" x 7.25") or an Envelope no smaller than 5.25" x 7.25"
8.5" x 11" Pre-Scored to Fold to 5.5" x 8.5" (V&H) Our 6" x 9" Booklet Envelope or an Envelope no smaller than 5.75" x 8.75"
*Please note that envelopes are not included with Greeting Card orders. Visit our Envelope page to see all sizes available. Get personal with customized greeting cards. Whether it's for the holidays, a birthday, or just because, show your loved ones and your customers you're thinking of them. It's a direct marketing strategy that works every time. Quantities of 25 and 50 will be printed on the digital press. This product is scored, not folded. Envelopes are not included. Design ornate greeting cards that everyone will love to put up as a display. Get festive for the holidays and send all your customers holiday greeting cards and birthday cards to show them your appreciation. You can also send them out to thank your customers for referring new business. Choose one of our Gloss stocks for a beautiful shine, the 14 pt. Uncoated Cover for a textured look, or one of our Matte stocks for a more subdued and vintage look. High Gloss UV Coating makes the products more durable, so your greeting cards will last longer. You cannot write or print on products with High Gloss UV Coating. If you'd like to write on the back of your greeting card, choose the 14 pt. Uncoated Cover or select High Gloss UV Coating Front Only on the 14 pt. Gloss Cover. Our High Gloss UV Coating Front Only option may produce variation in color and brightness between the front and back (inside) of your product. 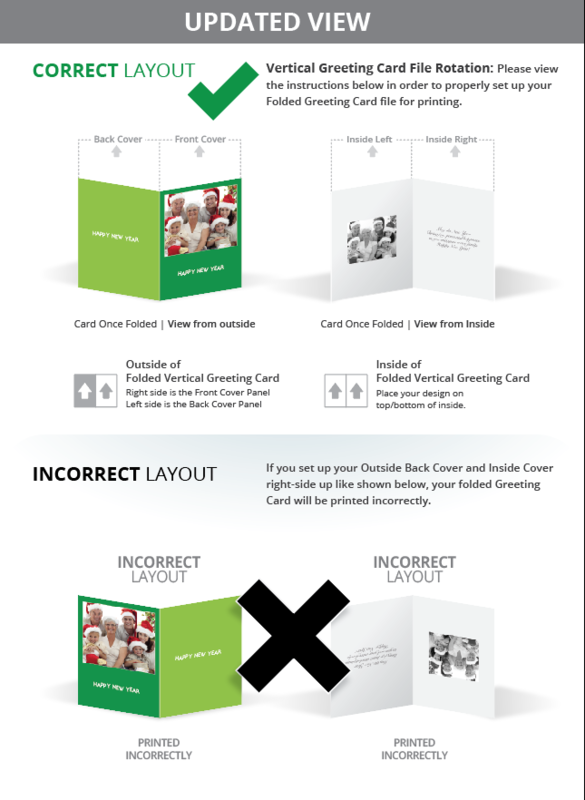 GotPrint is committed to offering high-quality greeting card printing for both private and commercial use. Our greeting cards are fully customizable, and we are ready to help you create eye-catching cards that are one of a kind. At GotPrint, we know that you lead a busy life, so we do everything possible to make designing and ordering your custom greeting cards quick and easy. If you already have a card design that you love, simply upload it at GotPrint.com. Our site accepts a variety of print-ready formats for your convenience. After your file uploads, you will have the opportunity to select either an Instant Processing Proof or a manually processed proof. With an instant online proof, you will receive an instant proof to review before placing your order. If you are still working out design options, the GotPrint Online Designer tool is here to help. This easy-to-use tool allows you to create and customize your designs online. Online Designer includes a large selection of pre-made templates that are ready for you to customize with your own text, logo and photos. You can also start from scratch and create your own design using our variety of fonts and images. For some occasions, you might want a little extra help to create greeting cards that truly make a statement. GotPrint is proud to offer design services through our amazing team of professional designers. When you choose this option, our team will work with you through everything from creating the initial idea to the final proof. We won't rest until your custom cards exceed your expectations! 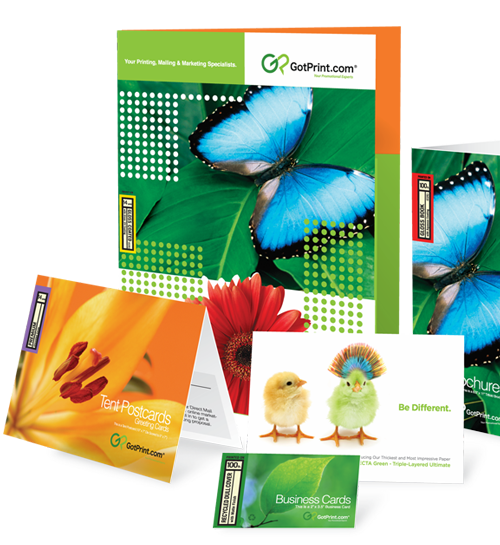 Whether you want to create custom greeting cards for a special family occasion or a new company promotion, GotPrint offers plenty of options at competitive pricing. We use high-quality inks, durable paper stocks and appealing designs to create cards that are sure to impress your recipients. In addition, we know that timeliness is very important when it comes to mailings. Our turnaround time is guaranteed, so you do not have to worry about your order arriving late. Our technologically advanced production facilities are housed throughout the United States, so we can offer appealing turnaround times while still giving our customers great pricing! E.g., Final Size: 8" x 6"
Size with Bleed: 8.1" x 6.1"
Prices include processing one set of uploaded files and creating a single proof.